To fill its current bus driver shortage and anticipated vacancies for next school year, Polk County Public Schools will host a series of transportation job fairs in February. The first event will be on Tuesday, Feb. 5 from 8:30 a.m. to 1:30 p.m. at the district’s Support Services location, 1430 State Road 60 East in Bartow. 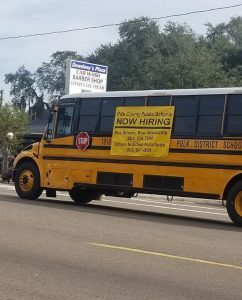 The school district currently has 15 open positions for bus drivers, but is looking to hire between 75 and 100. “We’re also looking to fill additional positions for anticipated retirements and drivers who will be relocating over the summer,” said George Millar, senior coordinator of transportation services. 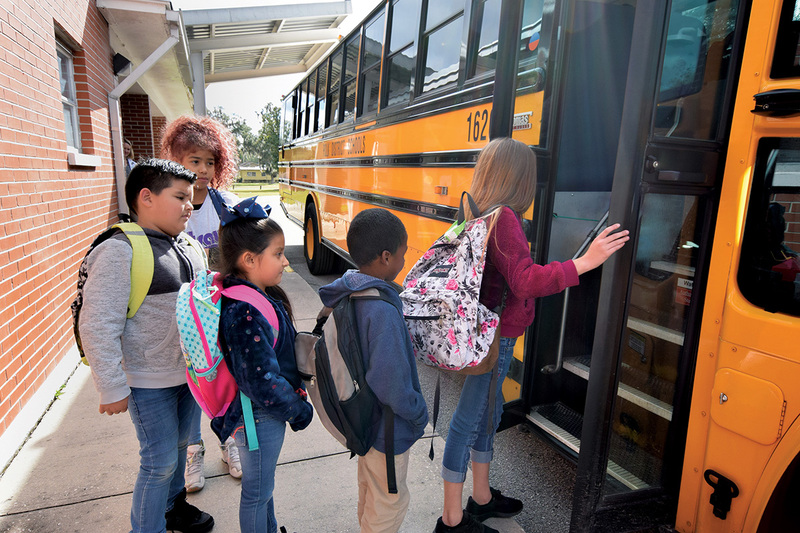 At the start of the 2018-19 school year, PCPS faced increased bus delays because of a shortage of bus drivers. Since then, to make the positions more attractive to prospective drivers, the district has increased the starting pay and reduced the education requirements; a high school diploma is no longer required. Drivers now start at $10, but earn $13.40 once they are appointed. After 90 days, they receive full benefits including medical insurance and optional dental, vision and other insurances. Millar said being a bus driver comes with numerous other benefits as well. He’s heard stories of bus drivers being recognized for the difference they make in students’ lives. 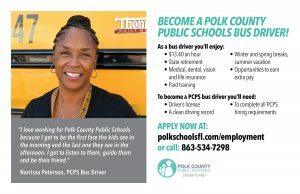 The recruitment fairs will coincide with Love the Bus Month, an annual campaign organized by the American School Bus Council to celebrate the importance and role of school bus drivers, and other transportation personnel in education. Click here to learn more about PCPS transportation services.